Jessica is currently a resident of Riverton, NJ. 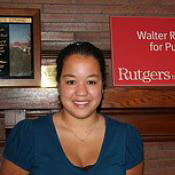 She graduated with a bachelor’s and master’s degree in Criminal Justice from Rutgers University-Camden. Jessica was a project assistant at WRI and worked on the PRI-CORP initiative among other projects. This page was printed from http://rand.camden.rutgers.edu/2014/02/18/boatwright-jessica/ at 3:55 PM Monday, April 22, 2019.